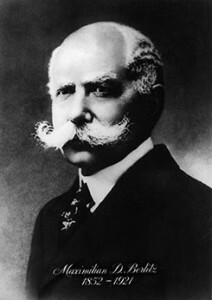 Berlitz was founded in 1878 by Maximillian Berlitz. Already running a successful centre, Maximillian Berlitz needed a new French instructor to teach and hired a French assistant by the name of Nicholas Joly. Joly had been the most promising candidate, but when the Frenchman arrived in Providence, Berlitz was horrified to find that Joly spoke no English. As Mr Berlitz was sick at the time, he told Joly to lead classes to the best of the Frenchman’s ability. Berlitz asked his assistant to point at objects, repeating the French word for them, and act out verbs. Upon his return, he was surprised to see the great progress that the students had made and realised the importance of this discovery i.e. learning a target language throughthe target language rather than the traditional techniques which characterised learning until this point. Today, Berlitz continues this spirit of innovation, with a range of learning techniques and programme formats; incorporating the benefits of new media, such as Internet based e-learning where appropriate, and introducing new programme formats such as our Total Immersion¨ to cater for new client needs. Berlitz Dublin was established in 1900 and many thousands of students have passed through the doors, since then. At Berlitz Dublin, we are committed to delivering the best learning approaches and strategies. Our goal is to ensure that you, our students, make the maximum progress in the time that you study with us and that we support you in realising your career and life-goals.